Welcome back to Tribal Apocalypse, the PRE where it's Week 8 since the Legacy Tribal Wars format was removed from MTGO then promised to be reinstated. Never forget. Purification Process, Stage 2: after the double Shaman actions from last month, this time it's one of the Big Three tribes that pays the toll, with Goblin ending undefeated and losing a key piece in all the following Pure Events from now on. 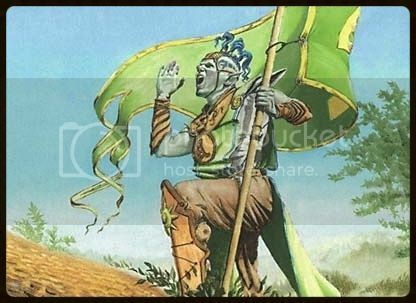 Remember that only the Major League tribes are affected, and the chosen card must be particularly significant for that tribe and used in the undefeated deck. Therefore, the options in Gq1rf7's build were essentially three (since he didn't use neither Goblin Guide nor Goblin Piledriver): (Goblin Bushwackler), Goblin Chieftain, and Goblin Grenade. After some consulting, I opted for Goblin Chieftain, because Bushwackler is also a Warrior. So, I give you the new banned card for Pure Events, one first step towards defanging Goblins (which incidentally, and not surprisingly, are now the most successful tribe in Tribal Apocalypse, with 13 victories, same as Human). The Goblins ended undefeated at the expense of Slivers in Round 4. Had the latter managed to come out on top instead, Crystalline Sliver would have been banned. In a Naya build, it would have been (Predatory Silver). And so on. You can now appreciate better how this process is going to work. The reactions in the room were positive, and I'm happier and happier with this idea. On the Singleton vs. Kaleidoscope front, I didn't get any answer last week, so I'm going to wait and see if someone has something to object this week, then I'll go on and switch half the remaining Singleton events to Kaleidoscope events. So this is the winning Goblin build by Gq1rf7, about which can read and see more in today's Show and Tell. It's interesting to note that Gq didn't get to play Price of Progress a single time during the entire event. But apparently, didn't even need to. In this early phases of the Purification Process, most of the successful Pure decks are fairly typical builds. The unlucky ones are more interesting, like this Assassin build by AJ_Impy, trying to make heroic work through Mark of Fury. Rex was sorely disappointed in his deck's performance at the end, but I played with similar builds in the past myself, and they're fun and can be lethal. This one is a good start that needs improvemenst, as discussed below. Gq1rf7 did it again, placing yet another of his Goblin builds at the top of the Cheapest ranking. It happens when the most expensive card you use costs 20 cents. The replays are back! Yay! They're still plagued with bugs, like the point-of-view player occasionally being in the top half of the screen, with a detached hand window floating around. Didn't you really think that they disabled them in order to fix them, right? But hey, at least they're back. This way I can show you this interesting couple of games between your truly _Kumagoro_ and RexDart, the former piloting Angel, the latter piloting Spirit. Two builds stemming from the same midrange/combo broad category, although Rex definitely missed on Recurring Nightmare to complement all those discard outlets and death-trigger-happy Spirit Dragons that only ask to be abused (I'm also generally not too fond of an over-reliance on 1-for-1 disruption spells, that turn into terrible topdecks in late game, especially Inquisition of Kozilek). The Recurring didn't show up in the first game at all, anyway. After a start where we both durdle a little due to The Tabernacle at Pendrell Vale, while a couple Lingering Souls face a solitary Bloodghast, it's time for the Angel engine to shine, thanks to one of the most underrated discard outlets, Peace of Mind. Excellent at keeping aggro at bay while advancing the battleplan, thanks to its single-mana, repeatable effect, Peace of Mind eventually gets to discard an Angel of Serenity, then followed by Karmic Guide. Karakas does the rest by entirely neutralizing Kokusho, the Evening Star. 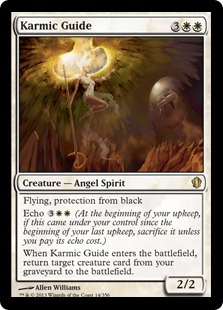 In the second featured game, the Angels managed to assemble their full combo, with Recurring Nightmare sacrificing Angel of Serenity to bring back Karmic Guide, which in turn brings back the sacrificed Angel of Serenity, at the same time taking out of the equation any new threats on the opponent's board (essentially bouncing them back to the opponent's hand again and again), and giving me fresh gas from my own graveyard. It's all for naught, too, as this is definitely Obzedat's game. Peace of Mind and Baneslayer Angel do all they can to delay the Ghost Council's manoeuvers, but in the end the group of phantoms is out of reach for the Angel of Serenity engine (I also make at least one mistake by attacking with a Guardian Seraph into Kokusho for no discernible reason), and once again it's Karakas to seal the deal, involved in a great move that exploits a final, lethal instance of Obzedat's ETB trigger. Great game all around. Moving on, here's event winner Dániel Kui a.k.a. Gq1rf7's Goblin build at work in two separate games, first against romellos and his Slivers, then ML_Berlin and his Soldiers. In Dániel's own words: "Most of the games were won by fast 1 CMC Goblins dealing a lot of damage in a few turns, as seen in the two games I had the replay for. Luckily, those two games are quite representative of how I won the games in the tournament in general." Your tribe must be Archer. Your deck must include one copy of at least 9 different Archery Theme cards from this list: Bow of Nylea, Nylea, God of the Hunt, Crossbow Ambush, Slingbow Trap, Viridian Longbow, Arrow Volley Trap, Arrows of Justice, Avenging Arrow, Borrowing 100,000 Arrows, Hail of Arrows, Infused Arrows, Serrated Arrows, Archery Training, Hankyu, Heavy Arbalest, Viridian Longbow, Wolfhunter's Quiver. You must include at least 3 copies of one Legendary Archer to play the role of Robin Hood and lead your upstart band of rebels to victory. (In Singleton events, this requirement becomes a single copy of 3 different Legendary Archers). You must enter Tribal Apocalypse with the deck and achieve at least 2 match victories, not including byes or forfeits. Only one prize is available and it is handled and assigned by RexDart (so not Kumagoro nor MTGO Traders). If two or more players both achieve the challenge in a single week, the player with the most match wins will take the prize. If the players are still tied, the player with the most unique number of cards from the Archery Theme card list will take the prize. The prize will be one Mercadian Masques non-foil copy of Bribery, so that you can rob the rich of their best creature and give it to the poor... or just give your opponent a nice face-smashing! The Hamtastic Award: The first quarter of the Biodiversity Prize dedicated to the memory of Erik Friborg has ended with the victory of mihahitlor, playing a total of 10 different tribes (one more than AJ_Impy) in the past 3 months: Kithkin, Soltari, Goblin, Human, Zombie, Plant, Elf, Vampire, Knight, Warrior. The new quarter starts this week and will end June 28. By that date, the player or players who registered the greatest number of different tribes will get a 5-tix certificate from MTGO Traders. The Champion's Challenge: AJ_Impy, our reigning Ultimate Tribal Champion, has issued a running challenge of his own: play with a deck featuring 4 copies of a card he'll nominate, and win 3 matches with it during a single event, and AJ will reward you with 1 tix (which you'll keep as eternal memento because it's the tix the Ultimate Champion gave you). You'll be required to prove through a screenshot (or calling either me or him as witnesses, but only if we're not playing!) that you actually played the card and/or activated the card's abilities at least once during the event. And the first chosen card is... Sunforger! Good luck, folks! Videos: Send us replays of your games and we'll feature them in these articles! Don't know how? Read this quick guide in 6 easy steps and start saving your tribal feats for posterity! Vote for your favorite Burn spell on the Topdeck Awards! There were a lot of games where one or two life points made all the difference for me last week. I won one of those, against you Kuma, but was on the losing end in the others. It is certainly possible that with some tweaks and a bit more luck, the deck might go 3-1. It also took me quite a long time to figure out the correct lines of play, which is because I can no longer test out tribal decks in the Casual Room on account of the Tribal Wars filter still being gone, so I was relying on just goldfishing a bunch of hands with no practical experience having played a few of those cards in any real match. The main problem I perceived with the deck is that I got totally blown out by a very straightforward red aggro deck and by any hyper-aggressive start by the Bird deck. I didn't upload the replay against mihahitlor because it wasn't very exciting, and my commentary consisted of figuring out how to live slightly longer and eventually hoping that mihahitlor would make a mistake, which I knew he wouldn't because he plays about 99% mistake-free. I did a pretty decent job predicting what would be in his hand, and what he might play, and it just didn't matter. My deck had a fun and appealing endgame but needed some more help to actually get there. I assumed Souls of the Faultless would be great against aggro in the Pure Tribal environment, but I kept facing down armies of fliers and direct damage. If I played anything like it again, I would need to solidly improve the aggro matchup. I would certainly add in at least one Recurring Nightmare, you're totally correct there. It is still possible to practice in Cas, it just takes patience, perseverance and spelling out things very clearly to people. It's exceedingly annoying. But is is doable. Yeah, Rex, you typically prepare too much against combo, but Tribal Wars will always be mostly aggro, or at least something that can easily go the aggro route when they see you're starting slow. 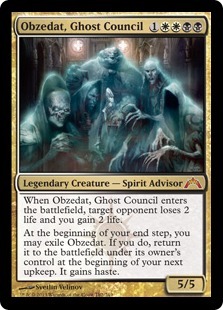 I think that Spirit deck can take two routes, either lose those Dragons and go midrange Orzhov Rock with Obzedat as your finisher, or commit to graveyard combo. Both the Dragons and Bloodghast are combo pieces to me (Bloodghast can't block, doesn't buy you time, I can only see it played straight in some super-fast aggro Vamps where everything costs 2 or less). They need enablers. I like Souls of the Faultless a lot, that's a right call, in both possible versions of the deck (in a version with green I would use Carven Caryatid in that spot, but it's interesting doing it in Orzhov colors for a change). How was Toxic Deluge? You and romellos are the first using it in TribAp. Losing life when you're already hemorrhaging can be tough against aggro, but it's certainly a very fast BSZ. I'm pleased with the performance of Toxic Deluge in my deck. There is no harm from one copy or even two. It's actually quite effective against aggressive decks, if you manage to cast it during early turns as a cheap mass removal to stabilize the board. And its life drawback is not that much relevant as you're trading future combat damage possibility priorly as a slight life loss (only 2 or 3 life loss, instead of 6-8 life). Later, it can also serve as a one sided sweeper in a deck, full with lords like Slivers or Merfolks. I knew I wanted Cabal Therapy as my hand disruption because it A) gives me a sac outlet for the Kami dragons, and B) in a pinch I can target myself to put them in my yard, in a pinch. Plus I consider myself pretty decent at casting Cabal Therapy, and it's one of my favorite spells. 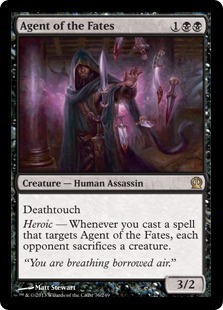 So that is largely why I used Bloodghast, to have those huge plays where Cabal Therapy turns into a 3-for-1 because I can cast Bloodghast on turn 2, sac it to flashback Therapy, and get Bloodghast back later. Bloodghast also gives me renewable fuel for Phyrexian Tower. I didn't really have any room for simple mana ramp like Signets, so I was leaning on Tower and Crypt Ghast to help accelerate into the top-end threats. And if I added in Recurring Nightmare, Bloodghast would be important there too. But I think Therapy and Tower alone are enough to justify Bloodghast, and I base that on playing all those cards together twice with Orzhov Vampires last year also. 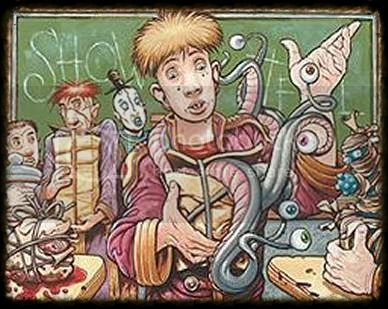 In goldfishing the deck, I was drawing too many Karmic Guides without anything to use them on, which is why I cut back on the combo-ish side of the deck. This has to be a Pure Tribal deck, because death-trigger dragons don't work when 60% of the field has 4x StP and 4x PtE in their deck. So that means Entomb is banned, and I don't care for Buried Alive, so it really couldn't be an all-in reanimator deck. Toxic Deluge was OK, I chose it mostly because it was 3-cmc, and everything in my deck either survives a Deluge for -3/-3 or comes back from it, and it can kill pretty much anything. I don't like to rely on 4-cmc sweepers because they're usually too slow unless I am playing Sol Lands or Signets. I thought I would have enough life gain to make Deluge castable and flexible throughout the game, but I think that was optimistic. I would cut it to 2 maybe, but there aren't any other great options. 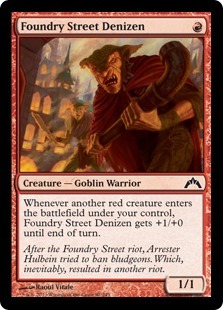 Against red aggro decks, the life loss is a bigger problem, because they can just burn you out. Against white weenie decks it usually wouldn't be a problem, because their follow-up to a board sweeper is some stupid 2/1, but the Bird deck overcame that in game 3 by having Soulcatcher's Aerie out prior to the board wipe. Aerie is a deceptively strong/weak card. Strong if you have no way to reset it (rift or other bounce) or get rid of it, and weak if you can. I think that is why it is an auto-include in any birds deck. I dislike auto-includes on principle, but can't help respect the card as a good call usually. Oh yeah, Bloodghast/Cabal was good, you did it in our match. It's just that those Dragons really scream Recurring. Trying and hardcasting them (with just 2 not-too-reliable Towers and 2 very frail and not so fast Ghasts, which probably get killed on sight) was probably the main issue, wasn't it? Plus, if you can't recur Kokusho, why should you even want to kill him, except when your opp is down to 5 life? I think it'd be more in your style to turn this into Orzhov Rock with Obzedat as a centerpiece and curve-topper. By dropping Dragons, Angels and Ghasts you get 9 slots you can fill with good beater and utility Spirits. At CMC 4 you get strong options that may fit an Obzedat deck like Windborn Muse, Graveborn Muse, Guardian of the Guildpact, and Hokori, Dust Drinker. Even Razorjaw Oni can make sense with the white Muse around, considering Obzedat usually doesn't block, and Bloodghast can't already. Neat action while I was away. Just to make sure: I can use "16x tribe members + 4x changeling" in Underdog event, even though the tribe has enough members, right? I am totally against changing Singleton to Kaleidoscope, even if it's 50% of the time. The current tally will be update below. 30 votes needed before a decision will be taken. 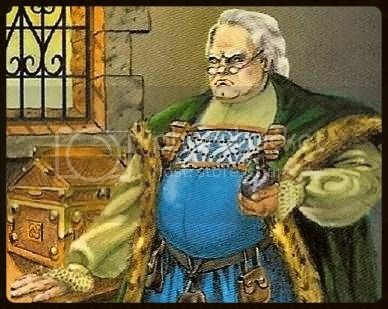 I'm for staying with singleton, and for two linked reasons. Singleton events promote a less repetitive game experience due to the additional variance. By contrast, Kaleidoscope Tribal has a severely restricted pool of cards that are worth playing at all, pushing people to play a lot of the same sort of cards.